Proficiency in underwater communication is not only a vital part of scuba diving training, it also makes diving a much more enjoyable and safer experience. 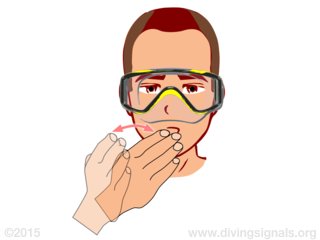 This website intends to support beginning recreational scuba divers in learning underwater communication via hand signals. 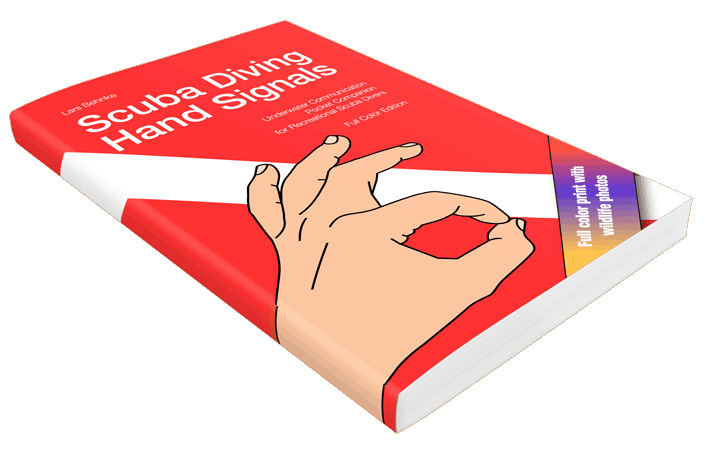 If you like this site, consider buying Scuba Diving Hand Signals as paperback book or app for iPhone and iPad. You'll get the hand signals presented here and many, many more. Thanks for your support. Although the author has made every effort to ensure that the information on this website is correct, he does not assume and hereby disclaims any liability to any party for any loss, damage, or injury, including death, caused by errors or omissions, whether such errors or omissions result from negligence, accident, or any other cause. The information on this website is meant to supplement, not replace, proper scuba diving training. Scuba diving poses some inherent risk. The authors advises readers to take full responsibility for their safety and know their limits. Never dive without proper training and certification! Click the images below to learn what they mean. Point at the diver who will lead with one hand. Point at the diver who is supposed to follow with the other hand. Move hand indicating the follower behind the hand indicating the leader. 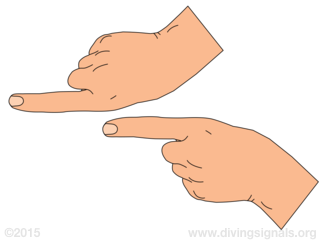 Both hands should point in the target direction. When two or more divers intend to follow an underwater route, one diver should lead the team. This is not necessarily the diver with the most experience in underwater navigation. Clench one hand into a fist, leaving the thumb extended and pointing upward. The ascend signal is a question–response signal. Signaling “Are you ready to ascend?'' requires a diver’s buddy to either reply with the same signal to begin ascending or use a different signal to indicate an alternative suggestion. Cross arms in front of chest and rub upper arms. Becoming hypothermic underwater is dangerous for various reasons. It decreases the diver's concentration, attentiveness, and motor skills. Some divers have problems controlling an inflator with numb fingers. Divers who get excessively cold underwater should end the dive. Shrug shoulders and raise palms, bending arms at the elbows. 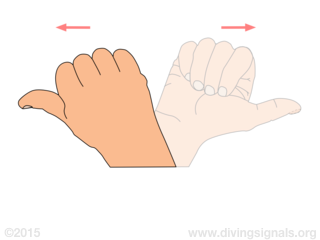 Raise hand vertically, keeping fingers together, with your palm facing the diver you are communicating with. 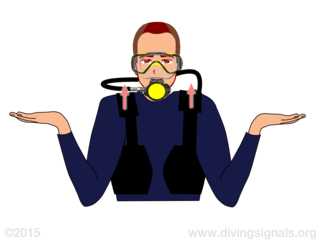 Technical and cave divers typically favor the clenched fist to indicate Stop. Repeatedly shake your raised forefinger from side to side. The don't signal is typically followed by another signal indicating the forbidden action. Clench one hand into a fist, leaving the thumb extended. Point with your extended thumb in the target direction. 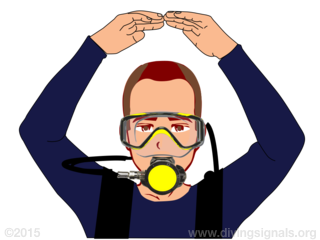 Many divers use this signal to alert a diving buddy to the direction in which they intend to swim. 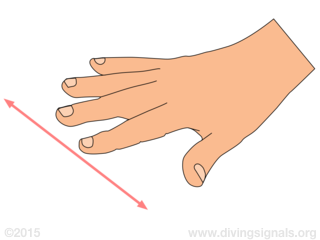 Alternatively, some divers use the this way (CMAS) signal to indicate a direction. Face palm down and spread fingers slightly. Move hand up and down repeatedly. Remove regulator from mouth. 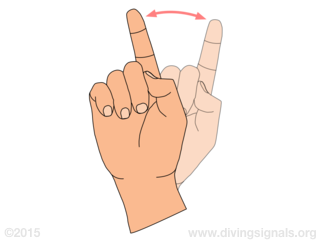 Move fingers of one hand, palm facing your body and fingers together, toward and away from mouth repeatedly. 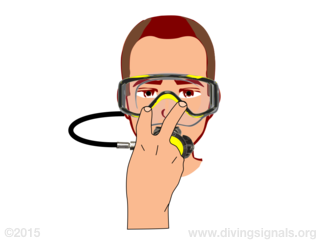 Divers use this signal to indicate a need for air. A dive buddy should offer his or her octopus regulator immediately. Then, the team should start an alternate air source ascent. 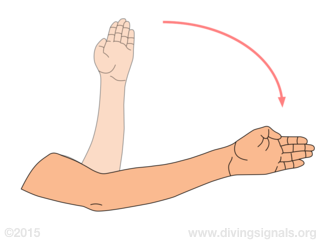 Shape a large O by reaching both arms overhead with fingertips touching. Divers use this signal at the surface as it is easier to identify from a distance than is the standard OK signal. Clench your fingers into a fist. Extend your arm toward the source of danger. 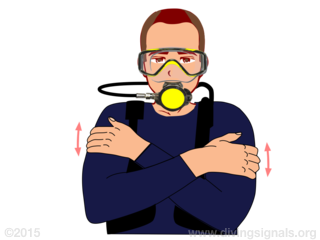 Divers use this signal to alert a dive buddy of a visible danger, for example an aggressive animal. PADI divers use this signal as a general purpose signal for indicating danger. Place hand, palm down and fingers spread, against your other arm’s forearm. Rock hand back and forth along your palm. This signal is generally followed by another signal indicating the source of the problem. Clench one hand into a fist, leaving the thumb extended. 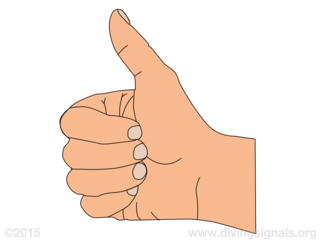 Rotate fist with extended thumb back and forth 180 degrees. This signal is used to indicate confusion regarding the intended direction in which to swim. 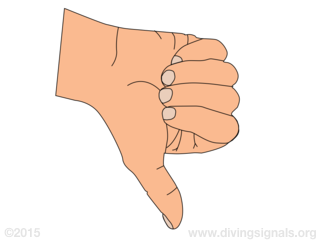 Clench one hand into a fist, leaving the thumb extended and pointing downward. The down signal is a question–response signal. Signaling “Are you ready to descend?'' requires a diver’s buddy to either reply with the same signal to begin descending or use a different signal to indicate a problem. Holding one hand several inches in front of your chest, clench hand into a fist. Move fist toward chest. Although listed here, this signal does not necessarily indicate a problem. When your buddy signals low on air, both of you should slowly ascend, make a safety stop, and end the dive. 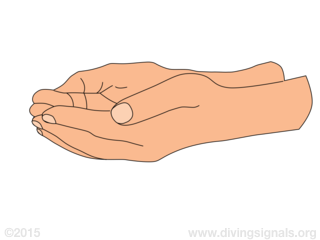 Cup hands together into a bowl shape, with palms facing upward. 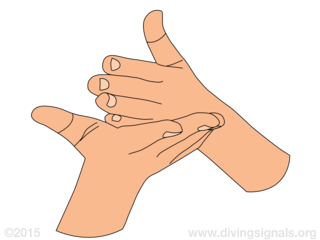 Hold one hand flat and horizontal, palm facing up and fingers together. 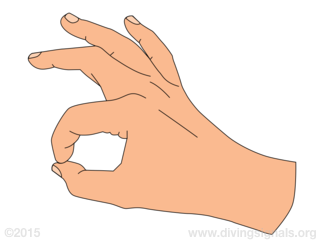 Place other hand perpendicular to the first, roughly pointing in the target direction. 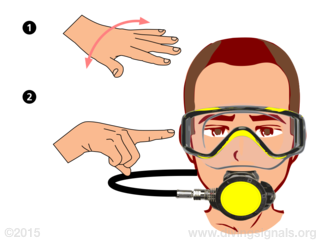 Divers use this gesture to indicate their intention to follow an underwater route. Although the signal suggests a compass, it does not specify how to navigate. Divers commonly use natural navigation or compass navigation. Signal problem. Then clench one hand into a fist, leaving the forefinger extended. Point forefinger to the ear. Divers experiencing problems clearing their ears when descending should ascend a little and try it again. If all attempts to equalize fail, the team should end the dive. If the problem occurs while ascending, it is recommended to descend a few meters and then restart the ascent more slowly. Clench one hand into a fist, leaving the forefinger extended. Point with the extended forefinger to the object or person of interest. Divers use this signal to alert a buddy of something. It should not be confused with the this way signal. 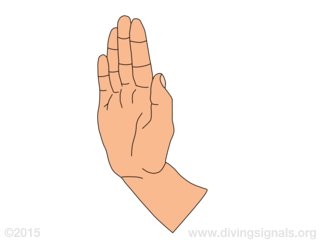 Clench one hand into a fist, leaving the forefinger and middle finger extended and slightly separated. 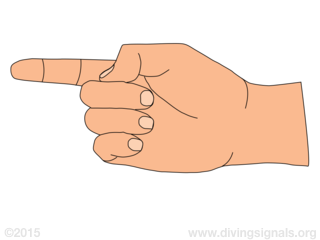 Point with extended forefinger and middle finger to your eyes. This signal is typically followed by a second signal to express where or at what to look. 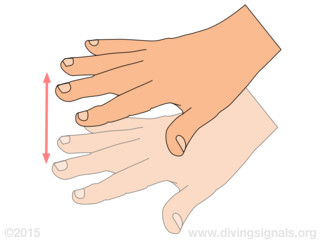 Touch thumb to forefinger in a circle. Extend other fingers. This is a question–response signal (that is, it is used to both ask a question and give a response). Signaling “Are you OK?'' requires a diver’s buddy to either reply with the same signal to indicate “yes'' or use a different signal to indicate a problem. Hold hand flat and upright, with fingers together, bending arm at the elbow. Lower hand in the target direction. CMAS divers favor this alternative signal over the standardized this way signal. 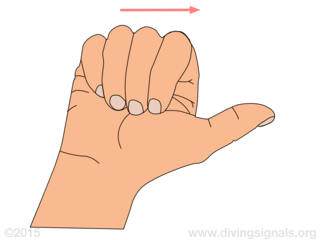 Hand flat, fingers together, and palm down, move your hand in a horizontal line across your throat. 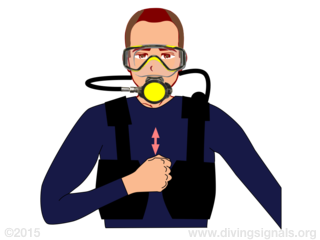 If divers run out of air, they should follow the emergency ascent procedures recommended by their dive organizations. 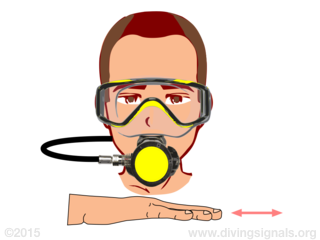 CMAS divers use a slightly different signal to indicate “out of air''. Instead of the cutting motion, they move a horizontally extended hand back and forth in front of their throats. Face palm down and spread fingers. 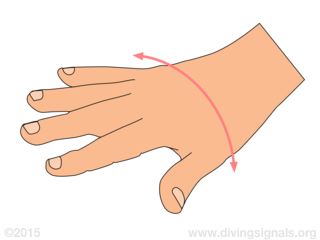 Slowly move your hand back and forth along a horizontal line. 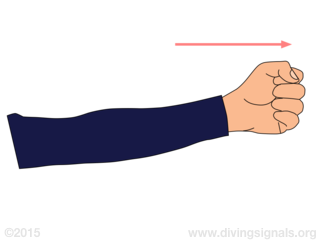 When divers reach their target depth, they use this signal to indicate remaining at the current depth. No part of this publication may be reproduced in any form or by any means without the prior written permission of the author.